TGS5042 is the standard model of the TGS5000 series of low cost electrochemical carbon monoxide sensors. The most notable feature of this sensors is its excellent stability derived from Figaro’s patented electrolyte, a very low concentration solution of KOH, KHCO3, and K2CO3. As a result, the sensor shows excellent stability in long term operation despite having only two electrodes. In addition, by optimizing the sensor’s internal structure, the evaporation rate of the water reservoir has been minimized. As a result, expected sensor life has been extended to 10 years for both TGS5342 and TGS5042. 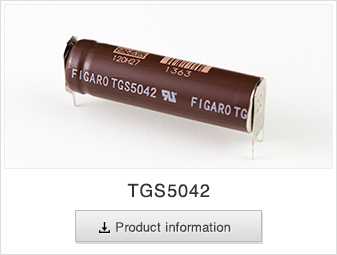 Although in general electrochemical-type gas sensors are considered to be more expensive than metal oxide semiconductor (MOS) type sensors, due to Figaro’s unique electrolyte, the TGS5000 series has achieved a cost effective structure with two electrodes. As a result of production volumes of more than ten million per year and Figaro’s intensive cost reduction efforts, the price of TGS5042 has reached a competitive level against MOS sensors. * Direct soldering to pins is possible. * Wave soldering can be done. * Individual sensitivity data printed on the sensor body can be used to eliminate the gas calibration procedure. to meet the UL standard. For customers who want to simplify detector design, Figaro can offer the ready-to-use module CMM5042 with TGS5042. 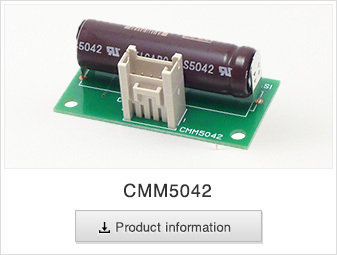 This module provides analog output voltage proportional to CO concentration. CMM5042 is also capable of detecting sensor trouble. What approvals does TGS5042 have? The sensor has received UL2034 component recognition. Does the sensor comply to RoHS restrictions? when the sensor electrodes are open-curcuited? According to Figaro’s test results, short-circuiting the sensor for one hour should be sufficient to stabilize sensor output after as much as 6 months storage in fresh air. Nevertheless, the period to reset the sensor’s polarization depends on the type(s) of gases existing in ambient air, ambient conditions, storage period, and the customer’s circuit. For achieving the best results, Figaro recommends that users conduct tests at their production facility to determine the optimal stabilization period for sensor output in air. Are any special precautions needed to use TGS5042 for a simple CO analyzer? To obtain quick response, the gas inlet of sensor of the sensor should be located nearest to the detector slits or opening. For this application, TGS5042-B00 is recommended. Please cut the Nickel ribbon as short as possible and connect an insulated copper wire by soldering. In addition, it is recommended to make small compartment with slits at least in two sides around the sensor. Refer to Sec. 3-3 Housing Design for Quick Response. How can electric noise be prevented? Since sensor impedance is 10Ω or less, the sensor itself will not be a source of electric noise. However, the sensor is easily influenced by external electric noise since sensor output current is very small. Power-supply noise should be minimized, an anti-electrical noise circuit pattern should be made, and a CR circuit should be used to prevent influence of electrical noise.